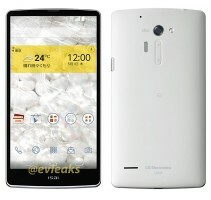 The Japanese market version of LG’s yet to be revealed G3 flagship might have leaked on Twitter. A duo of press shots showing a mysterious high-end LG handset made the rounds on the social network, courtesy of @evleaks. 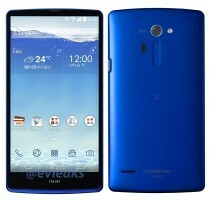 The leaked press photos reveal the front and the back of the yet to be announced device in blue and white color scheme. Dubbed LG isai, the smartphone is headed to KDDI in Japan. There is no word on the specs of the upcoming handset just yet. However, LG isai impresses with ultra-slim bezels (possibly to accommodate that rumored 5.5” QHD display in a more manageable footprint). The volume rocker on the back of the leaked handset on the other hand is standard high-end LG smartphone affair. While we don’t see a physical power/lock key on the device, we wouldn’t be surprised if that mysterious strip on the left of the volume rocker plays the role (it could well be a fingerprint scanner too). LG isai is yet to be annoucned. We’ll keep a close eye on any further details on the handset.